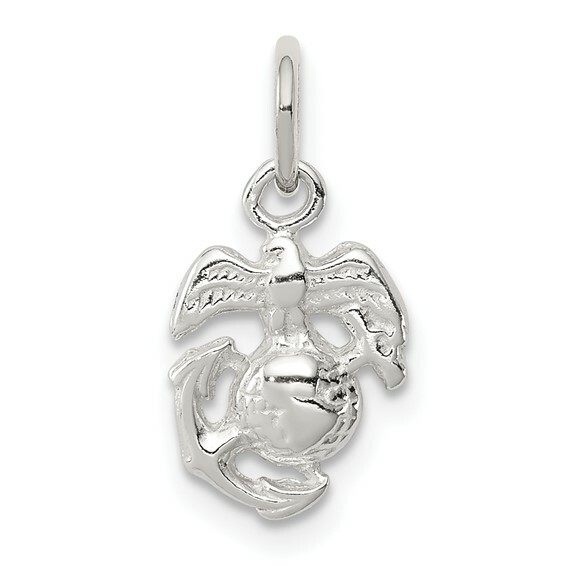 This very small USMC eagle, globe and anchor charm is made of sterling silver. Item size: 3/8 inch tall and 3/8 inch wide. This item is half the size of a penny. This item weighs approximately 0.5 grams. Chain sold separately. Army trademarks and insignias are reproduced with permission from the Department of the Army. Permission has been granted for use of the Marine Corps, Air Force, Coast Guard and Navy insignias on jewelry; however, usage does not indicate endorsement by the Department of Defense or any of its components. This is a beautiful little Eagle, Globe and Anchor!